2017, Mixed Media on Paper and Transparencies, 88"x76.5. Photos by Jacob Bailes. Through the process of erasure, this socially-engaged art project intends to queer the 1967 text Understanding and Counseling the Male Homosexual—a psychological handbook that utilizes discriminatory language to describe gay men and reinforce normative values. 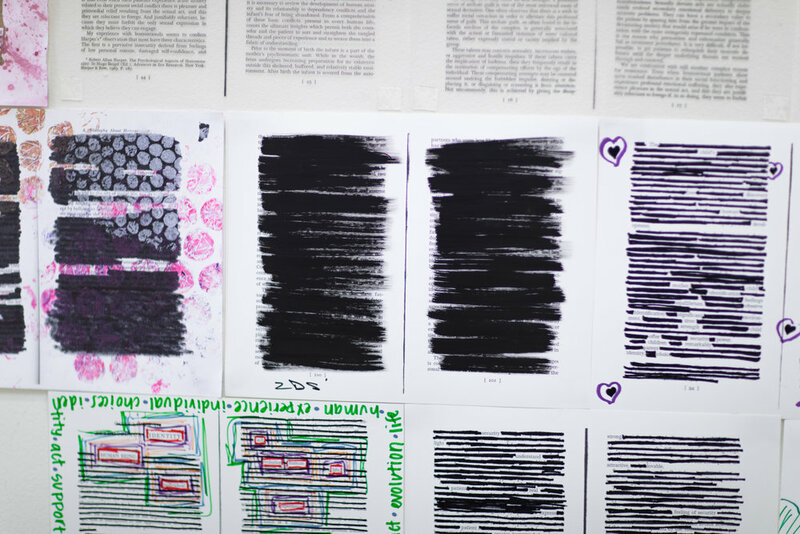 In addition to a collection of 32 completed erasure poems from a diverse range of participants, the center of the heart-shaped installation is made up of 10 blank pages printed on transparencies. Viewers are invited to use markers to redact the text on these pages, which are periodically cleaned to allow new participants to engage with the original text. The project objective is to deconstruct historic, oppressive practices through creative resilience.